CAIRO (Reuters) - The evening Egypt's army ousted Islamist President Mohamed Mursi, Christian lawyer Peter Naggar celebrated on Tahrir Square with even greater joy than when autocrat Hosni Mubarak fell from power two years ago. Naggar remains deeply relieved that a year of Islamist rule ended a fortnight ago and yet, as the initial excitement fades, many members of his ancient Christian minority fear Mursi's Muslim Brotherhood will not give up power so easily. Neither is the Coptic Christian community under any illusion that the army's installation of an interim government devoid of Islamists spells the end to its long-standing grievances, such as difficulties in getting state jobs, equality before the law and securing permits to build churches. Still, Naggar is happy to see the back of the Brotherhood. "This is the real Egyptian revolution," said Naggar, who had joined mass protests in Cairo on June 30 demanding that Mursi go. "The people stood up against Islamism. This is the end of political Islamism." Coptic Pope Tawadros II backed the military, standing with liberal and non-Brotherhood Muslim leaders next to armed forces chief Abdel Fattah al-Sisi when he announced Mursi's removal on July 3. Communal tensions and attacks on Christians and churches rose sharply under Mursi, Egypt's first freely-elected president. Many Copts, who make up about a tenth of Egypt's 84 million people, left the country where their ancestors settled in the earliest years of Christianity - several centuries before the arrival of Islam. Islamists are staging a vigil at a Cairo mosque and regular protests to demand Mursi's reinstatement, and it is dawning on Christians that they could yet return to power when elections are held under a military plan to restore democracy. Some might even resort to force, they fear. Islamists have killed at least five Copts since Mursi's overthrow, according to the Egyptian Initiative for Personal Rights, a rights group. "It's an improvement that Mursi is gone but I am still not entirely relaxed," said Roman Gouda, visiting with a friend the Egypt's biggest Cathedral in the Cairo district of Abbasiya. "I am worried because the Brotherhood keep protesting," said his friend Amir Habib. Habib was one of hundreds of Christian youths at the gated cathedral in April when fighting broke out between Copts and Islamists, who threw petrol bombs and fired birdshot from neighbouring houses into the compound. The Interior Ministry blamed Christians for starting the trouble by torching cars. Security is tight at the cathedral, which houses the Pope's seat, theological institutes, tailors for religious vestments and a nuns' home. Only one gate is open for the public, manned by security guards and policemen. Few worshippers come as many want to keep a low profile, a church official said. During Mursi's presidency, Pope Tawadros said he felt Christians were sidelined, ignored and neglected by the Brotherhood-led authorities. Copts were emigrating "because they fear the new regime", he said. 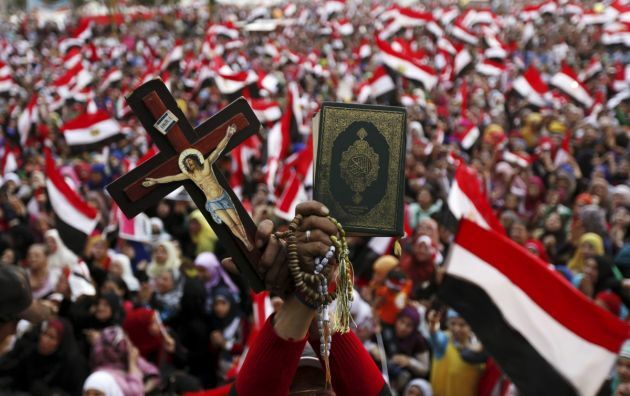 Scenes of people dancing on Tahrir Square when Mursi was deposed were reminiscent of the communal harmony during the 2011 uprising against Mubarak, when Christians protected Muslims at prayer and followers of both religions chanted together, brandishing Bibles and Korans. Copts are happy that the new interim cabinet, which will rule until elections are held, contains three Christians including liberal Mounir Fakhry Abdel Nour in the important investment ministry portfolio. Mursi's cabinet had just one Christian in the post of minister for scientific research. "This is a government for all Egyptians," said Naggar. "They got appointed because they are competent." But the Copts' long-standing complaints persist. "You cannot get a job in the police or also in many other state positions," said Habib, who works at a jewellery shop, a business line which has long attracted Christian traders. Many Christians, like Muslim Egyptians, hated the brutality and corruption of the Mubarak era, but say they felt safer under the man who jailed Islamists during his 30 years in power. Nevertheless, life was never entirely secure for the community even before the Brotherhood's time in office. One campaign group, the Mosireen collective, has documented how troops shot Christian protesters in late 2011 during direct military rule between Mubarak's fall and Mursi's election. Christian leaders acknowledge that some of the community's problems such as access to state jobs also affect Muslims in a country known for corruption and a weak legal system. HIJACKED THROUGH THE BALLOT BOX? Youssef Sidhom, a prominent Christian commentator, said he was disappointed with the interim leadership's constitutional decree. This reinstated an article in last year's constitution, drafted by Islamists and boycotted by the church and liberals, which said laws derive from principles of Islamic law. "That was very worrying and annoying and I think that bitter criticism has reached our interim president," said Sidhom, editor of the Coptic newspaper al-Watani. The biggest threat was that liberals and moderate Muslims will fail again to overcome their divisions, he said. This could hand another electoral victory to Islamist groups which have won every vote since Mubarak's overthrow and remain better organised than their opponents. "Our revolution may get hijacked for the second time by the Muslim Brotherhood through the ballot box so we have to be there. We have to stay united," said Sidhom, who has reported up to 50 attacks by Islamists on Copts since June 30. Moderate Copts fear a radicalisation of their own youth who believe some Muslim hardliners want to get rid of Christianity. "We Christians have been always discriminated against and tortured," said Michael Georges, another late-night cathedral visitor. "I don't see any change," he said, before riding off with his motor bike.